Some of the most common dynamic phenomena that arise in engineering practice—actuator and sensor delays—fall outside the scope of standard finite-dimensional system theory. The first attempt at infinite-dimensional feedback design in the field of control systems, the Smith predictor, has remained limited to linear finite-dimensional plants over the last five decades. Shedding light on new opportunities in predictor feedback, this book significantly broadens the set of techniques available to a mathematician or engineer working on delay systems. The book is a collection of tools and techniques that make predictor feedback ideas applicable to nonlinear systems, systems modeled by PDEs, systems with highly uncertain or completely unknown input/output delays, and systems whose actuator or sensor dynamics are modeled by more general hyperbolic or parabolic PDEs, rather than by pure delay. · A construction of explicit Lyapunov functionals, which can be used in control design or stability analysis, leading to a resolution of several long-standing problems in predictor feedback. · A detailed treatment of individual classes of problems—nonlinear ODEs, parabolic PDEs, first-order hyperbolic PDEs, second-order hyperbolic PDEs, known time-varying delays, unknown constant delays—will help the reader master the techniques presented. · Numerous examples ease a student new to delay systems into the topic. · Minimal prerequisites: the basics of function spaces and Lyapunov theory for ODEs. · The basics of Poincaré and Agmon inequalities, Lyapunov input-to-state stability, parameter projection for adaptive control, and Bessell functions are summarized in appendices for the reader’s convenience. 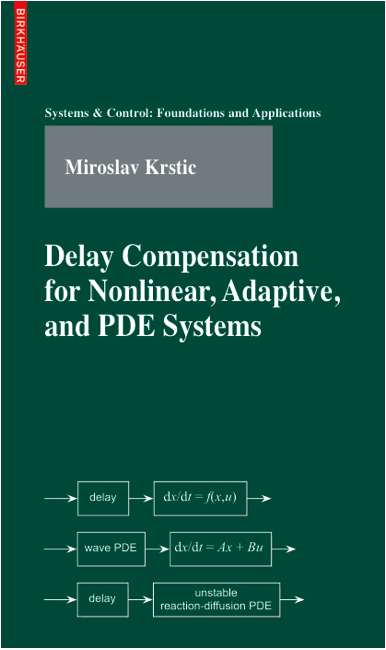 Delay Compensation for Nonlinear, Adaptive, and PDE Systems is an excellent reference for graduate students, researchers, and practitioners in mathematics, systems control, as well as chemical, mechanical, electrical, computer, aerospace, and civil/structural engineering. Parts of the book may be used in graduate courses on general distributed parameter systems, linear delay systems, PDEs, nonlinear control, state estimator and observers, adaptive control, robust control, or linear time-varying systems.